Today I venture out walking after the heavy snows from last week. As cabin fever sets in, I love to get outdoors to chase it away! The snow is abundant from two major storms last week… one was expected, and one surprised us all – even the weather forecasters. I am bundled up in winter attire and walking down onto the Miami & Erie Canal Towpath Trail in Western Henry County, just east of the Village of Florida. The trail is part of the US National Park Service’s “North Country Trail”. Arriving on the trail I am completely intrigued. 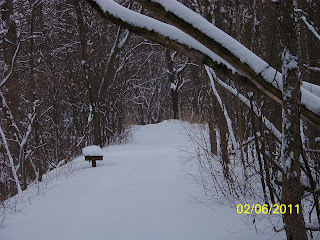 As often as I frequent the trail in other seasons, I am seldom here in Winter. The setting takes on a completely new and refreshing ambiance. The giant trees and dense underbrush-once teeming with growth and leaves now stand naked yet draped with snow in their silent slumber. On one side of me is the Maumee River- frozen solid with ice nearly two feet thick, on the other side is the Miami & Erie Canal. The sky overhead looms with grey and is heavily overcast. The air is still and weighs heavy with dampness. From indoors it may seem dreary, but outdoors on the trail, the grayness takes on a magical and mystical quality. I am standing in snow up to my knees. I am the first to walk on this trail through all this snow, as I trudge through the knee deep virgin powder. It’s refreshing how quiet and serine it is here. There is nearly complete silence. All the snow on the ground and the trees acts like a giant sponge, absorbing and muffling all the sounds. Occasionally I hear a dog bark in the distance, but that too is muted and silenced by the abundant snow. It is difficult as I continue walking through the deep powder. I must lift my feet very high with each step to overcome the depth of the snow. As I stop to catch my breath and snap some photos, I begin to feel the cold settle in. Winter’s Chill is invigorating, yet I must respect this force of Nature. I must keep moving to generate warmth for my body so it does not succumb to the forces of the ambient cold. If I were to stay down on the trail for any length of time, I would scout a place out of the wind to start a fire for warmth. Knowing I will return home shortly, I dismiss that notion and keep moving. As I strain sinking in this knee-deep powder, I can immediately see how snow-shoeing here would enable me to walk farther. The oversized shoes would prevent me from sinking into the snow, Next time I will bring snow shoes, but as I return to my world off the trail, I am re-invigorated, and my cabin fever is no more.